Cattle rubs, also known regionally as back rubbers, wicks or fly wipes, are a useful way for cattlemen to apply insecticide to the animals. A cattle rub placed in the pasture will attract cattle, as they realize rubbing on the device offers relief from biting and stinging insects. This basically turns the task of insect control over to the livestock and requires the stockman to only keep the rub soaked with the proper insecticides. Commercial cattle rubs are available, but they can be built from commonly found components on the farm. According to the University of Wyoming, a simple back rubber can be made out of a number of ingredients. They suggest using chain, wire or cable as the basis for the cattle rub. This inner core is then wrapped with burlap, creating the insecticide-carrying portion of the cattle rub. The chain and burlap assembly is placed between two fence posts about 15 or 20 feet apart. The cattle rub should sag so the lowest point of the rub is about 2 feet above the ground. Cattle will learn to duck their heads under the cattle rub and walk under it, spreading the chemicals in the cattle rub along their backs. The chemicals used in cattle rubs are almost universally oil-based. A water-based insecticide would evaporate too quickly. Still, a homemade cattle rub will need to be serviced more often than commercially purchased cattle rubs that are made of more absorbent materials. According to the website of the Samuel Roberts Noble Foundation, some insecticides can be mixed with diesel fuel for use in cattle rubs. Always read and follow label directions when using any insecticides. 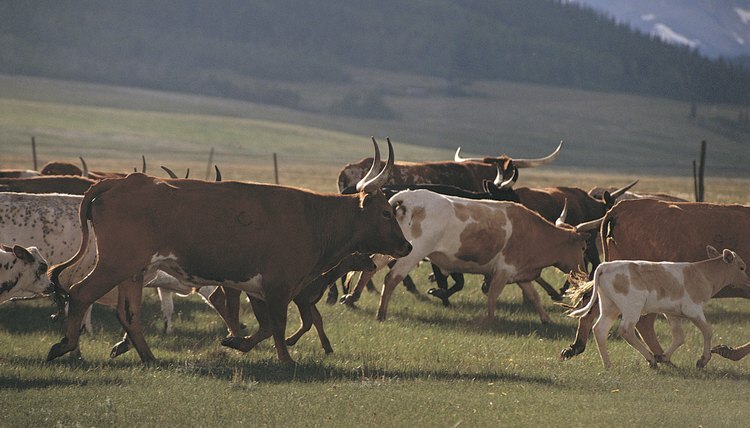 Cattle rubs are usually placed near water ponds or tanks. They also can be placed near salt or mineral feeders. The idea is to place the cattle rub in an area the cattle will gather several times a day. Often, cattlemen will place a dust bag in the same area. The homemade version of the dust bag is simply a burlap bag filled with insecticide powder. The dust bag is hung slightly lower than the shoulder height of the animals in the herd. When the cattle bump the bag, a dust of insecticide is released and settles on the animal. Dust bags are often hung in gate openings where cattle will have to travel. What Are the Treatments for Flies on Donkeys?